When you're forced to spend a few nights away from the most expensive house in the world, where do you stay to maintain the minimum level of extravagance that you need to survive? Naturally, you stay in the world's most expensive hotel suite: the Royal Penthouse Suite at the Hotel President Wilson in Geneva, Switzerland, yours for a mere $80,000 per unimaginably opulent night. 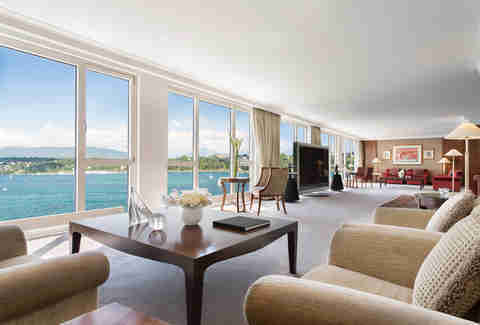 The Royal Penthouse Suite takes up the entire top floor of this world-class hotel and covers over 18,000 square feet. Guests have their pick of 12 bedrooms (two are master bedrooms), two massive dining rooms, and 12 marble bathrooms, including one with a Jacuzzi overlooking Lake Geneva. That lake, by the way, is as stunning as the suite. You'll have plenty of opportunities to take in its natural beauty as most of the walls are floor-to-ceiling windows that overlook the lake. 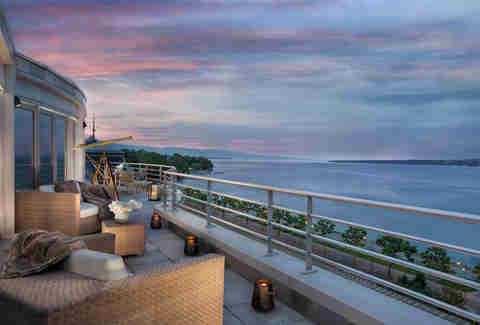 Plus, there's a massive terrace complete with a telescope that is, in fact, exceedingly fetching. If all that gets old, you're free (but kind of the opposite of free if you think about it) to entertain yourself with one of the largest televisions in the world, manufactured by Bang & Olufsen, a brand you're not even allowed to know about so forget we mentioned it. 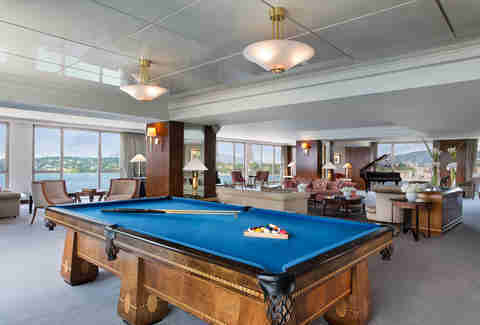 There's also a Brunswick pool table, a private fitness gym, a collection of "ancient books," and a Steinway grand piano. A spokesperson for Hotel President Wilson preferred to draw attention away from the suite's high price and focus on "the unique experience of this Suite." But spending more than the average American's salary on a single night is definitely an experience.